Aside from the hook-jawed male brown trout in the above photo you might notice the rare left hand Shakespeare 1761 reel, circa 1960s. It belongs to Denny, one of our trout camp regulars. He has three of them which he manages to keep working, somehow. He doesn’t care to fish with anything else and I can relate, even though I have ventured to the dark side. 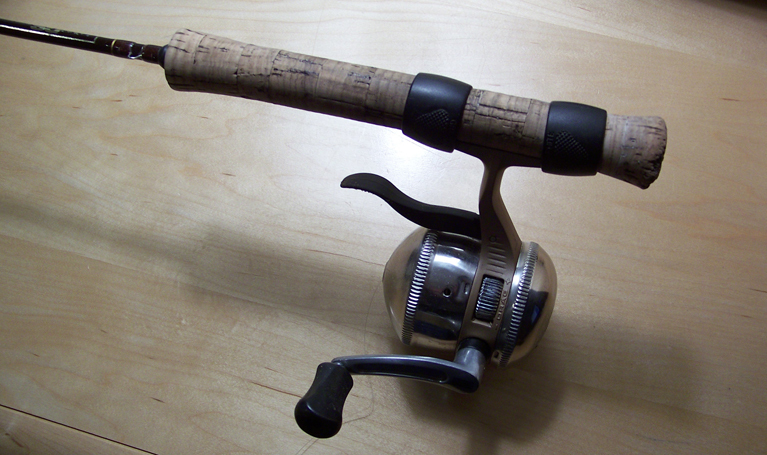 Compared to the spin cast reels on the market today, the old Shakespeare’s feel like precision machines. No high tech alloys or injected plastic, just well machined pieces that fit together in a surprising bit of functional engineering. There is nothing on the market like it today, and even Shakespeare couldn’t get it right when they introduced the 1810II, a remake of their most famous closed face spinning reel from the 60’s. When asked to recommend a spinning rig for small streams my answer is: I can’t. I have tried every brand of closed face spinning reel on the market and no one is producing anything that really works well consistently. I can’t depend on new spin cast reels lasting more than a season. Handles fall off. Pick-up guides stop working. Gears grind when there doesn’t seem to be a reason. I have tried the various “underspin” designs including those by Shakespeare, Pflueger, Diawa, and Zebco. For what it is worth I think the Zebcos are the most reliable maybe because they have a long history of spin cast reels going back to pushbuttons. Last year I used a 33 Gold Triggerspin and can say this: I caught a lot of big trout with it. I had to change line often because the tiny pickup pins wreak havoc on monofilament, but the reel was mostly trouble free. This might be a good time to mention my total dislike of open faced spinning reels – the kind with the revolving bail and open spool. For the type of casting I and my buddies do – it is just not an option. It goes to the type of casting we do – we pinch the line against the rod handle, release the bail, cast, and stop the lure in midair just above where we want the lure to land. The small hole in the cover of the close-faced reels allows us to catch and pinch the line against the rod handle to stop the lure in flight. With open spools – the line is not available to pinch because it flies off the circumference of the spool. I have a pretty good and inexpensive spinning rod that I bought at Gander Mountain, model GS Advantage IM6. It’s light weight, stout enough to hook trout, and nimble enough to use an underhand flip cast to rocket lures across the stream into nooks and overhangs – places where trout like those pictured above like to hide. It has a cork hand with sliding rings that allows placement of the reel at the back of the rod where it belongs (for balance). See below. So you can see I am not a purist and have visited the dark side. Tucked away in boxes somewhere I have a couple old closed-faced Shakespeare reels, similar to Denny’s 1761, I am saving for who knows what reason. One belonged to my grandfather, Jake Lucas, and I am afraid his ghost will come back and haunt me if I don’t take the same meticulous care of it that he did. He treated his equipment well – cleaning and oiling the reels often, placing them in a sock in an old cardboard beer case in the trunk of his 65 Chevy Impala. His rods were stored in hard cases. He would assemble what he needed/wanted when he parked at a stream side. He treated his fishing equipment like an old machinist treats his precision tools – with love and care. I should probably treat my $25 Zebco the same way but in the back of my mind I know it will wear out quickly no matter how many times I oil it up. 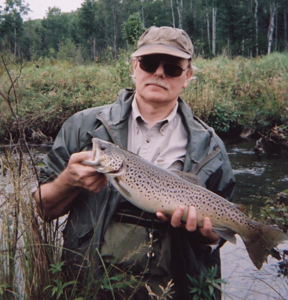 I should attribute the fish in the top photo – Mike, another trout camp regular, caught the larger brown and Denny the other nice one. 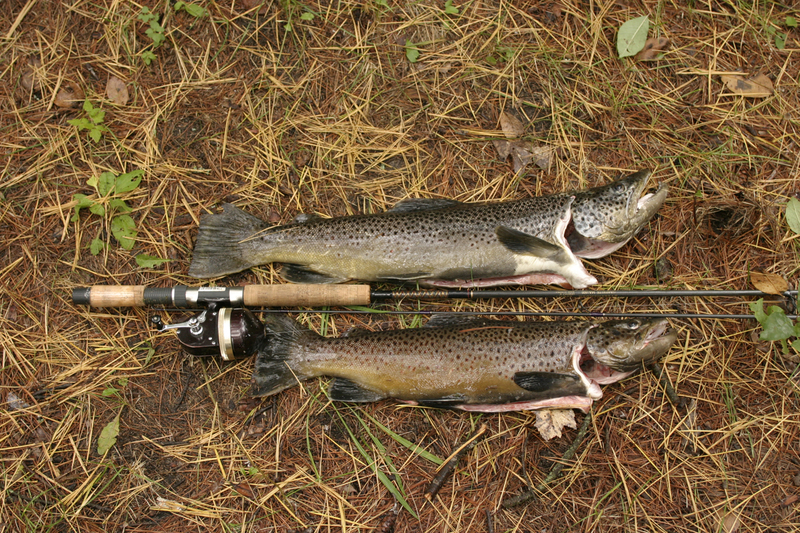 Last time I fished with Mike he was using one of the defunct Shakespeare 1810II reels and a long rod I might consider for steelhead, though it obviously works well for stream browns. 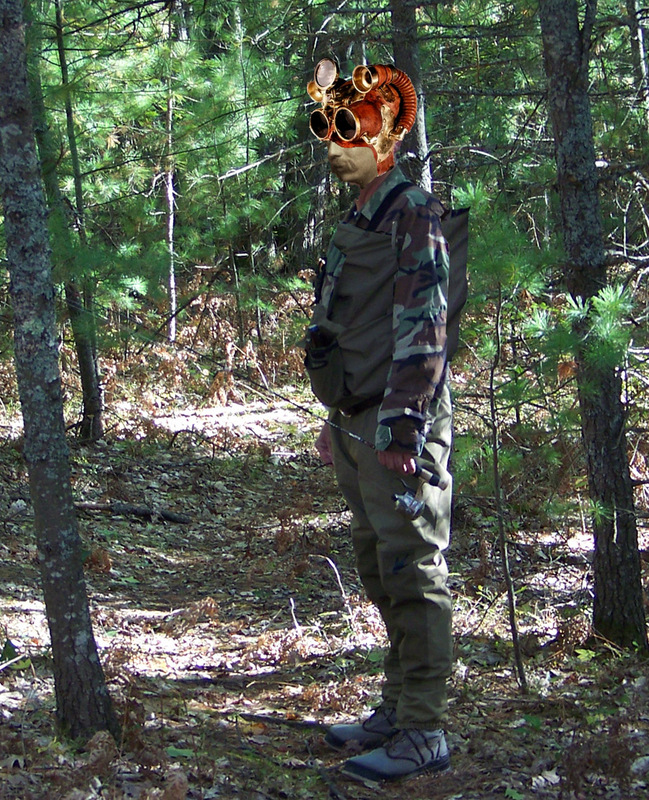 When HG showed up in his time machine looking for some flyweight Hodgman waders Feral Tweed pulled him aside to show him one of his own inventions, the blowgun firearm. The well travelled HG admitted he had never seen one before so Feral loaded up a retro muzzle-loading model and HG proceeded to blow a squirrel off a tall oak whereby Feral cleaned the rodent and put it in the stew pot with a mess of fresh vegetables and some unlabelled ingredients. HG asked about the ingredients but the conversation went silent. Feral buried the stewpot on a bed of coals and told HG to stick around if he’d like to go fishing. HG saw my Shakespeare 1810 reel and Wonderod, circa 1960s, and asked if he could look at it and I said that would be alright but before I knew it he pulled out a tiny screwdriver and had the side cover off the 1810 and was pulling out wrenches for a complete dismantle. I had to wrestle the darn thing away from him. That’s the way it is with these gadget guys. Where was he when the drive belt went out on my Whirlpool washer? You can’t scold a genius so I told him to check out my 61 Apache Chief camper with the aircraft aluminum box and foldaway pole system. “Look, don’t touch,” I admonished. He liked the camper and I could see the gears turning in his mind when he looked over at his time machine. A fold-out cotton duck canvas cabin tent on the aft end would make a nice addition. By now it was late afternoon and Feral had an extra set of waders so we headed over to a remote spot on the Pigeon River that has some sandy patches and dark bends that give up some monster brown trout. HG is a little guy so Feral’s old Simms waders came up to his neck which was funny, the more so because HG had on a retro pot helmet with wrap around goggles that fortunately were Polaroid’s since most of that stretch of river requires walking into the sun at nightfall. HG was a quick study. Feral showed him the Jake Lucas underhand flip cast and after casting straight up the first couple times he managed to bullet a #3 Blue Fox spinner at a grassy bank and was rewarded with sixteen inch brook trout which amazed both Feral and I since neither us had caught a brookie on the Pigeon since the dam went out at the Song of the Morning yoga ranch. We caught several more trout including a brown trout longer than HG’s forearm and after that we hustled out of there because we didn’t want HG to disappear down a beaver hole on the hazardous trek out. I said as much – and HG laughed saying that was how Jules Verne got the idea for Journey to the Center of the Earth. “Such a Klutz,” he intimated. Around the campfire, shoveling down squirrel stew with a cold Labatts, HG said he hadn’t had so much fun fishing since the time he and Hemingway knocked down a bottle of bourbon and took a rowboat out on the gulf. The sharks got their tuna but that’s another story.